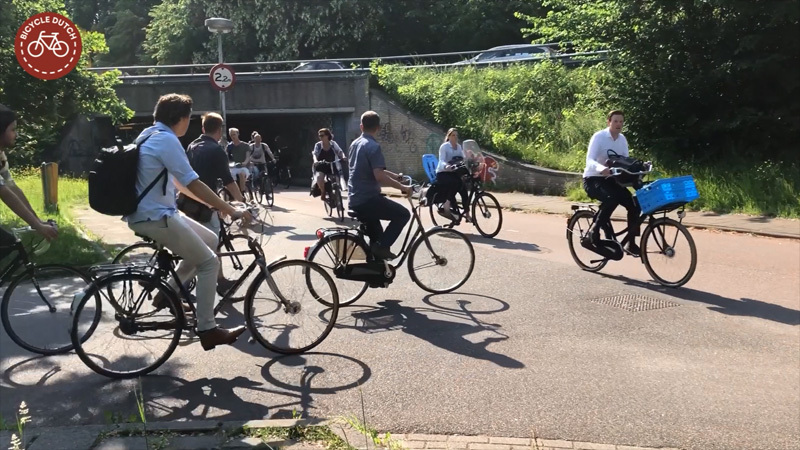 Protected separated cycling infrastructure has been the norm in the Netherlands for quite a long time. The Utrecht “Berekuil” was the first intersection in the country with a separate level for cycling and one for cars. It was opened in 1944 and it is still being used 74 years later! In the “bear pit” looking outwards through the tunnel in the direction of De Bilt (east). All cycleways are bi-directional, but – judging from the old pictures – that was always the case. The Utrecht Berekuil, looking east in the first half of the 1950s. Clearly visible are the four underpasses for cycling. Note that cycling could not take place on the projected “motorway” running north-south. (left to right on this picture). At that time there was no road to the right (north) yet, that was opened later. Picture Utrechts Archief. Recently I cycled to a place to film for a new blog post. 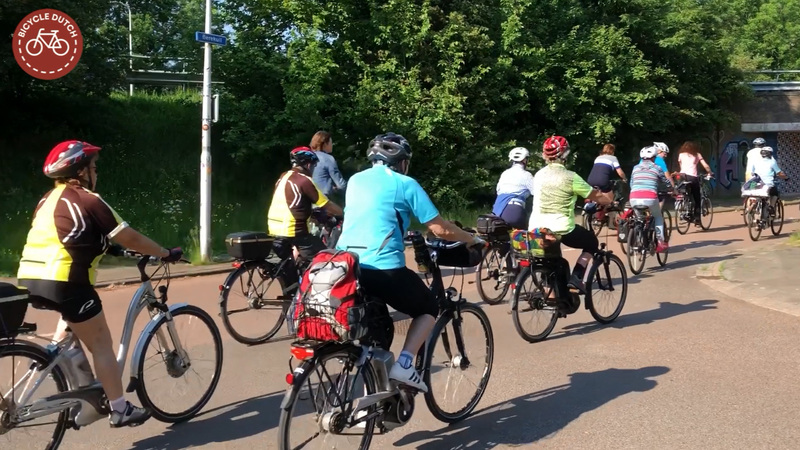 That cycle journey started in Utrecht during the evening rush hour. I had to pass the Utrecht “Berekuil”. 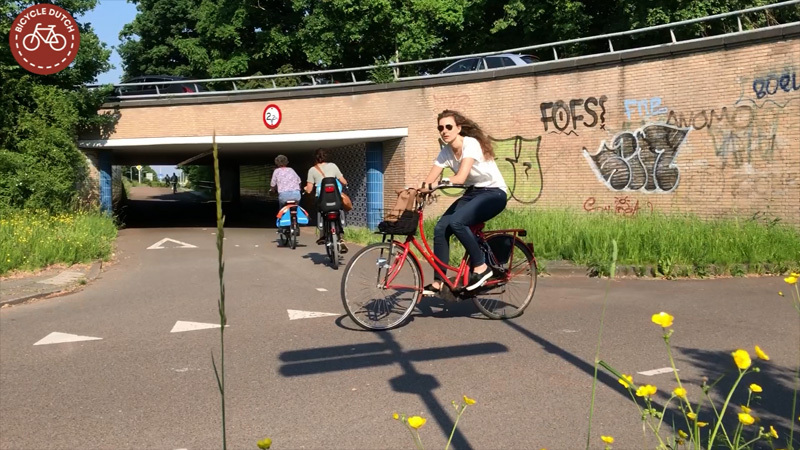 A 74-year-old raised roundabout with a lower level just for cycling. It was so busy that I was fascinated by the way people on their bicycles were interacting with one another. I had to stop and film here too. I already filmed here in 2009 but there were no posts to go with my videos at that time. I knew the history of this place is interesting enough for a new post and the end-result is this new post with three videos! The current aerial view as seen on Google Maps. One bus route tunnel is visible in the top of the picture. The bus route then turns to the left hand side of the picture. The bus road is barely visible between the motor traffic road and the trees. 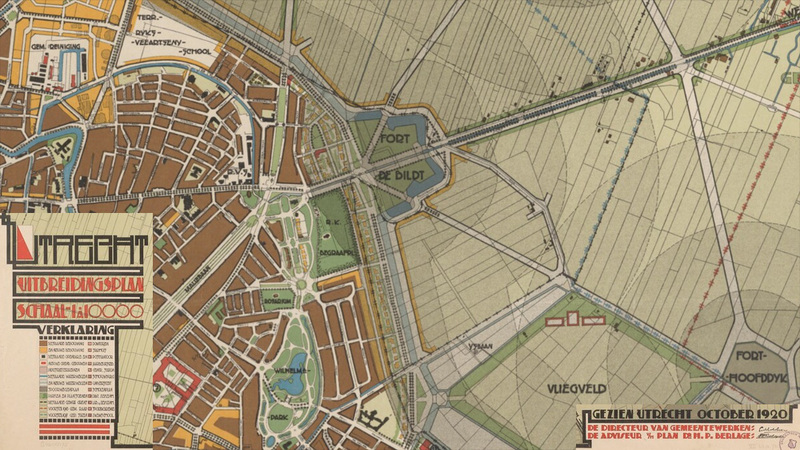 Details of the map for the expansion of Utrecht from October 1920 by architect Berlage. The Berekuil roundabout was not part of this plan, but later constructed at the left hand side of “Fort De Bildt”. In white the ring road at some distance around the city. In the right hand bottom corner an Airport was planned (and never built). The outer ring road was projected at the place where the A27 motorway was roughly built in the 1970s. A version of the map is in the Utrecht University Library where it was digitalised. 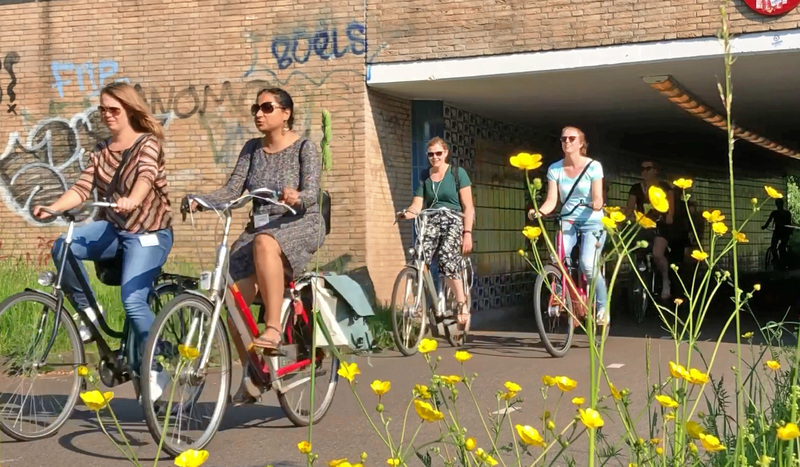 When you dig into the history of road building in the Netherlands you can see that decisions made very long ago have had a lasting impact on our urban design. The city of Utrecht commissioned world-famous Dutch architect Berlage to plan the expansion of the city in 1917. The beautiful map belonging to this plan was published in 1920. It shows planned circular roads all around the city; a novelty at the time. When the national government announced its first plan for new main roads in 1927 it also chose to build the national road network around the cities. The motive was that the narrow streets in the mostly mediaeval Dutch city centres were not considered to be capable to handle modern traffic. That decision caused some controversy. People said cities would miss business opportunities if traffic would not go through the cities. But a north-south bypass to the east of Utrecht was part of the 1936 revised national highway plan. This plan was created in a time that there were very few private cars; the 100,000-mark of private motor vehicles was only reached in 1940. The roads were certainly not only meant for people’s (future) journeys, they were also designed for a rapid transportation of goods. Where the new north-south road would intersect the important east-west route from Utrecht to De Bilt (and further to Arnhem) Rijkswaterstaat (the government agency for roads) designed a revolutionary new type of intersection: a raised roundabout for motor traffic with a separate level for cycling just slightly below normal street level. This was a first for the Netherlands. It meant people cycling benefited from a plan to improve motor traffic. That was not the last time this happened. One of the more recent well-known examples of this phenomenon may be the Hovenring in Eindhoven. The tags many people still wear reveal they are coming from one of the many workplaces that this roundabout connects to the city centre. This woman stops for cyclists coming from the right. That is according to the law but it is a rare sight. Most people try to slowly weave through the people coming from their right. 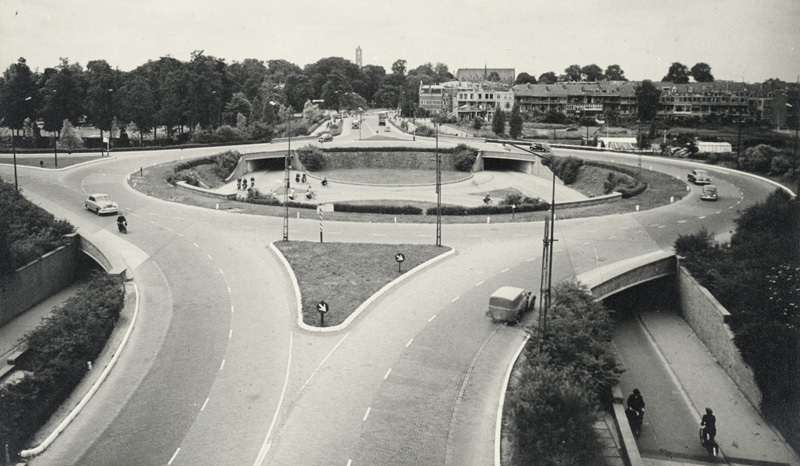 The construction of the Utrecht raised roundabout started in 1939 and was apparently held up, but not completely stopped when the Netherlands were occupied by Nazi Germany in 1940 when World War II reached the Netherlands. It took until 1944 before the roundabout was opened. It soon got the nickname “Berekuil” which means bear pit. The most accepted explanation for that name is that the shape reminded people of the bear pit in a zoo. There is also a claim that the name refers to the English/Canadian reconnaissance unit “Polar Bears” (49th Regiment) which liberated Utrecht. On May 7, 1945 they were marching into the city via this roundabout. The Utrecht Berekuil served as a blueprint for other such intersections in the country, notably in Arnhem and Eindhoven. I wrote a blog post about both earlier. The north-south road lost its status of national road when a new motorway around the city was built – even further to the east – in the 1970s. The road as well as the roundabout have since been municipal. A bus is about to go through the lower level of the Utrecht Berekuil. This bus route was constructed from 1998 to 2001. As part of a city wide plan to make the buses rapid. Since 1944 cycling can take place in a safe environment completely separate from motor traffic. Things do go wrong every now and then. The Utrecht archive shows examples of car drivers taking a wrong turn and getting lost in the lower level. At one time the entire lower level was under water after a main drinking water pipe had burst. In 1970 a truck loaded with cheese tumbled into the lower level. It landed upside down in a pile of cheese wheels. 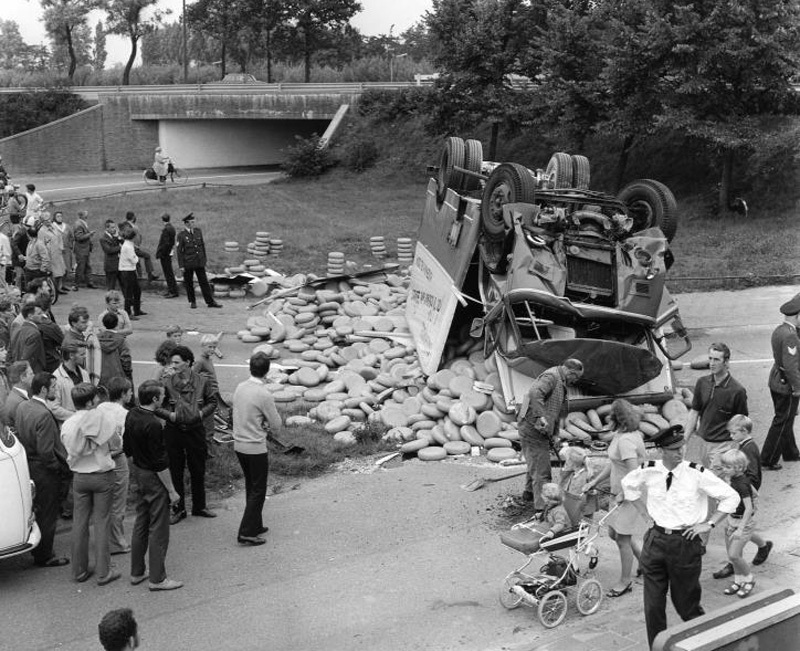 How Dutch can a traffic incident get? On 28 July 1970 a pile of cheese wheels landed at the bottom of the bear pit with the truck upside down on top of them. Possibly one of the most Dutch traffic incidents you can think of. Picture L.H. Hofland, via Utrechts Archief. An important reconstruction of the roundabout started in 1998. At the time Utrecht was creating completely separated bus routes in the entire city. This means buses can make their rides completely unhindered by other motor traffic. 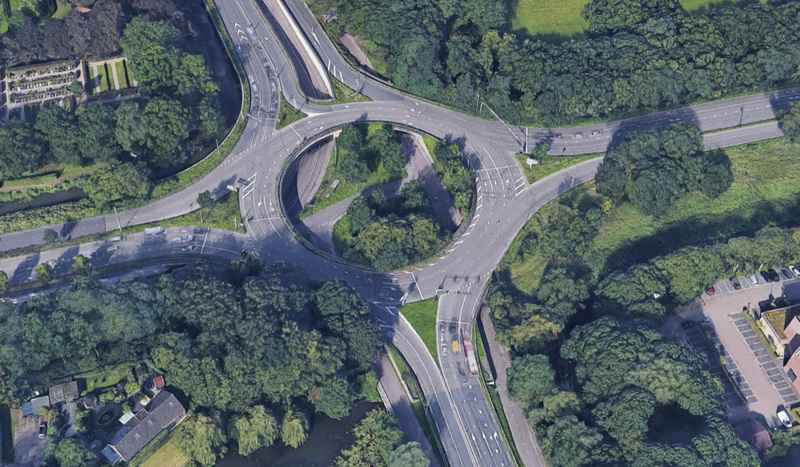 To increase the reliability of one of the lines to the Utrecht University Campus a bus route was planned right through this then 54-year-old raised roundabout. The bus route takes a turn here, which meant one of the four entrances for cycling was closed, but a new one (to the university) was built, keeping the total at four cycle underpasses. The bus route was built at an even lower level than the cycle level (because buses need more clearance). The two bus tunnels (entrance and exit) under the roundabout were finished in 2001. The complete intersection was renovated during the construction of the bus tunnels. At the same time a new work of art was completed to give the renovated underpasses a “pleasant, surprising and safe atmosphere”. Called the Bear Parade it consists of tiles with little bears (and a few big ones) which were placed on all the tunnel walls, a total of 650 square metres. In a 2003 interview Eline Janssens, one of the two artists who designed the work or art, explained that her art always refers to the location where it is placed. In this case she and Margot Berkman had also found the many explanations of the name “bear pit”. To combine the stories the women decided to place numerous little polar bears on the tiles. The many bears walking in and out of the city represent the thousands of people who enter and leave the city via this location every day. The colour blue was chosen to give the work of art a calming appearance. “The Bear Parade” a work of art by Berkman & Janssens from 2001 in all four cycle underpasses. The people in the foreground have the right of way but you can see they hold back their speed so the people going straight do not have to stop for them. This is the Dutch way to settle the priority and you can observe here how that is stretched to the limits. The Utrecht Berekuil roundabout was designated as a municipal monument in 2016. My 3-minute video with an explanation about the Utrecht Berekuil. 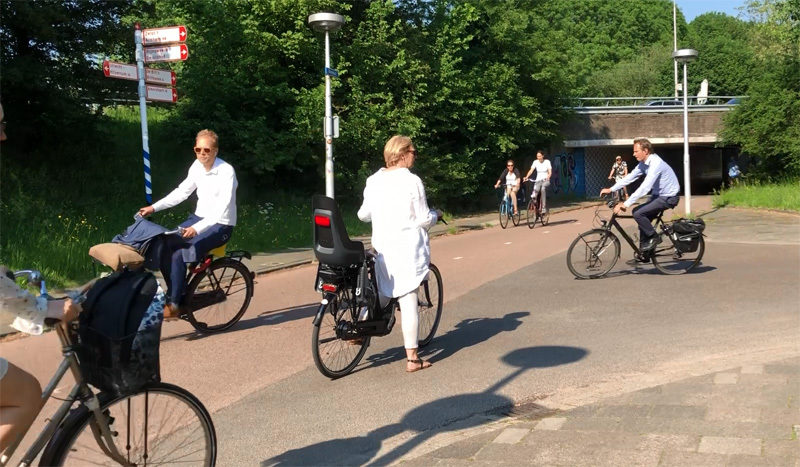 My video showing 20 minutes of the evening rush hour at the Utrecht Berekuil. 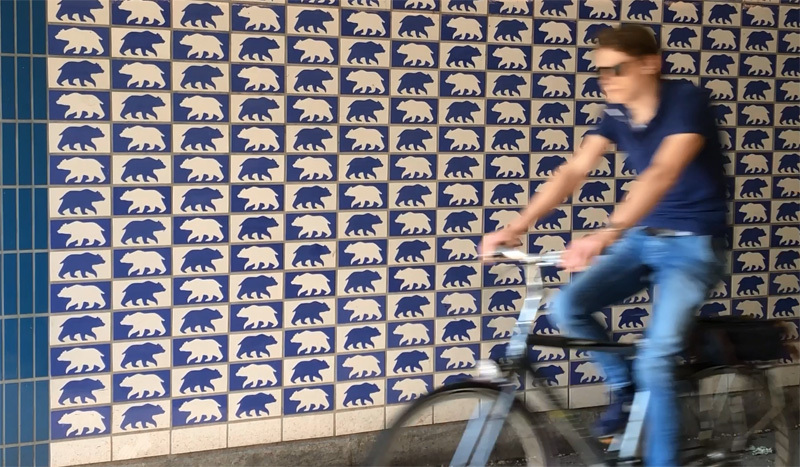 My video of a ride through the Utrecht Berekuil. In the last video, starting at 0:40, the latest reconstruction is visible. 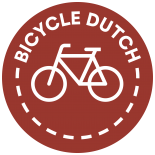 The cycle path is split up with a refuge area to assist cyclists coming from the right in the video to weave into the main stream towards de Berenkuil during rush hour. Some rather nasty accident between cyclists happened there in the past. 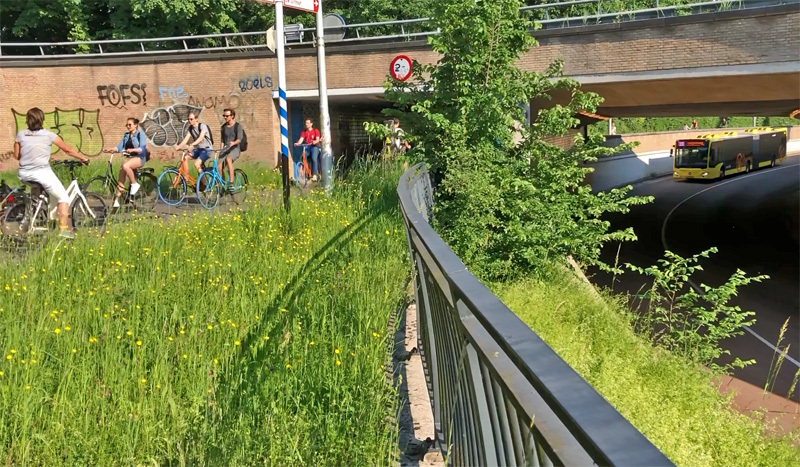 This entry was posted on 12 June 2018 by Bicycle Dutch in Original posts and tagged exceptional cycling infrastructure, grade separated roundabout, history, Utrecht, watching people cycling.